Best Camping Chairs For a Bad Back Reviews: Top-5 in April 2019! Suffering from a bad back is hard enough, but suffering from a bad back and camping is like having a gourmet meal and not being able to taste anything, there is no comfort, only pain from a bad back. That’s why campers can relax in mind, there are solutions, and there are exceptional camping chairs for sufferers of bad backs, upper and lower. Now let’s take a look at the five best camping chairs for bad backs. Which Camping Chairs For A Bad Back Are the Best? The Futura Air Comfort® is a recliner chair of the luxury category and is specifically designed for sufferers from bad backs. 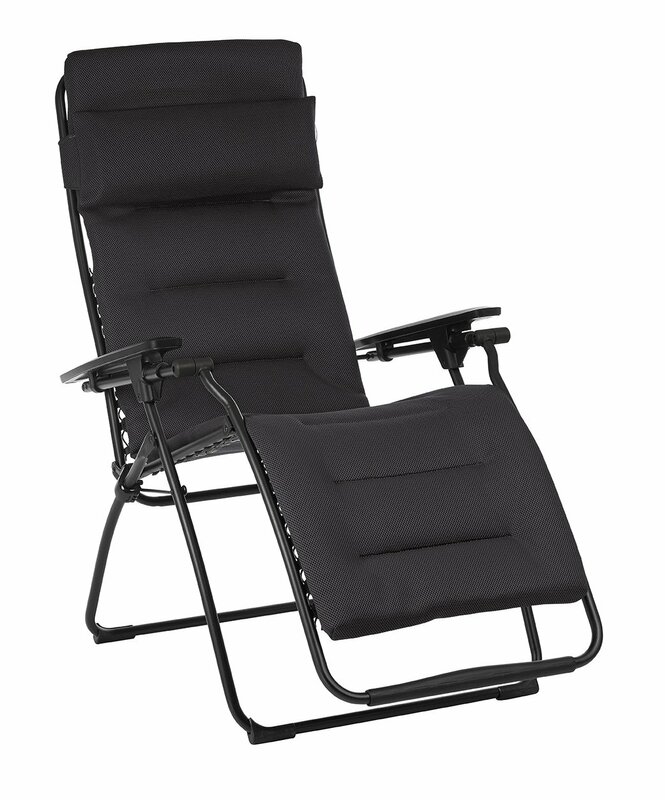 This amazing folding camping recliner is made from padded Air Comfort®seat pads; these are 3 layer pads constructed from breathable and permeable materials and are integrated with the Lafuma patented Elastomere clip suspension system. This model comes with fixed armrests that provide the lounger with seated adjustment control, and the finish includes a removable headrest cushion, a protective ring for a footrest, and foot glides. This model is made using 20mm steel tubing that is painted against corrosion and is light but strong. This is an exceptional mode, and while it is made from steel, is crafted well to resist corrosion and provide a solid seating experience. The Elite Folding Camping Chair with Lumbar Support is the Strongback flagship camping chair, and it comes with some amazing features that include a medically verified patented, frame-integrated lumbar support with an ergonomic seat for improved posture that prevents of leg pinch. This model comes with solid padded armrests, a cup-holder and an additional comfortable lumbar pad. This model is made to carry 300 Lbs, and the material is a heavy duty 600D polyester that is torn and wear resistant. The frame is a black powder coated durable steel frame and sits solidly on all surfaces. 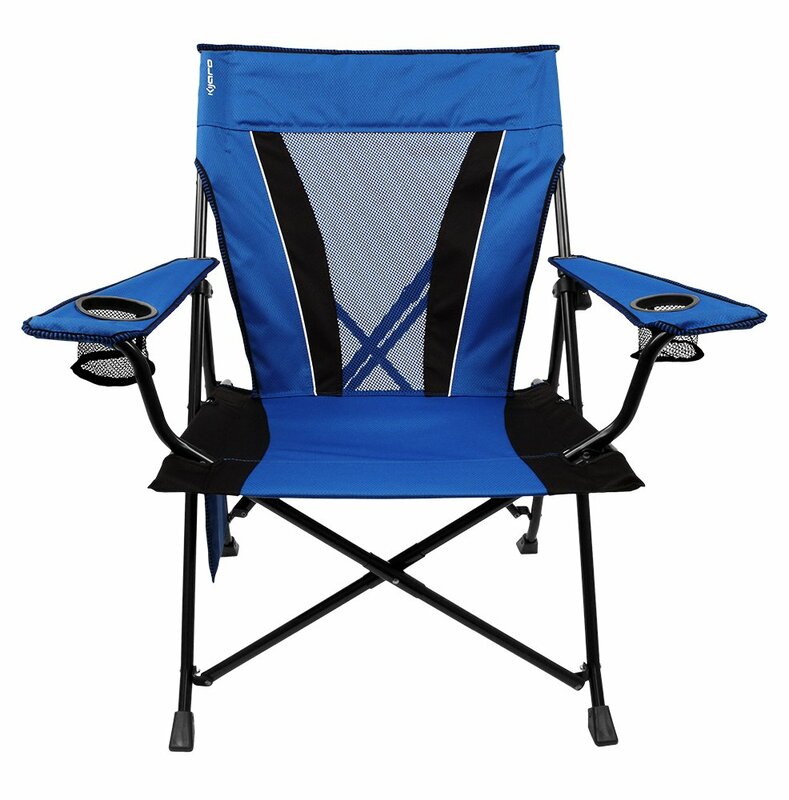 This is one of the leading camping chairs for people with bad backs and is considered to be one of the world’s best. The Kijaro™ XXL Dual Lock Oversized Chair is a leading lumbar supportive chair aimed at sufferers from bad backs. This is the bigger, oversized chair with patented dual lock technology. This chair is 2 inches wider and 1 inch higher than the standard, and it holds up to 400 lbs. The design includes a cushion in head and seat, mesh airflow on the back for breathability, 22 mm steel tubing for extra strength and durability, and also comes with 2 mesh cup holders, one is 2.75” diameter, and the other one is 3.5” diameter. Due to its size and design, this model provides ample support, plenty of room and is solid and seated well over all surfaces. This is the Hich Back version of the Timber Ridge model and comes with exceptional frame and material characteristics. This model is made using a durable 25mm powder coated aluminum frame, which is both lightweight and extremely strong. The material is a padded 600D polyester fabric, and together these materials support up to 300 Lbs. The seat comes with a deluxe thick foam padding, and the headrest is made from a soft neoprene. You also get wood armrests for strong natural support. This is a classic model with high back and a few extras that provide lightweight comfort. 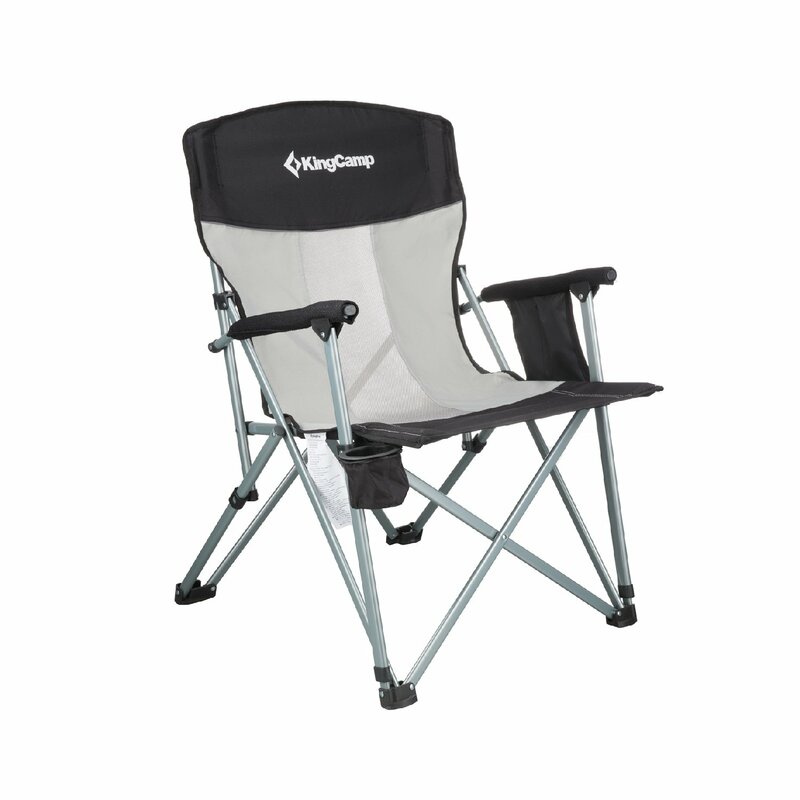 The KingCamp is a large chair designed for overall comfort and safety too. This model comes with the highest grade materials, designed for maximum support. To start off with, the material used as the fabric is a very thick 1200D oxford fabric, much thicker than 90% of the other products on the market. The frame is made from aluminum tubes and comes with a bracket structure, it supports up to 264.6 Lbs (120 Kgs) and is designed to fold and unfold easily and quickly. The KingCamp comes with a storage bag, cup holder and padded armrests. 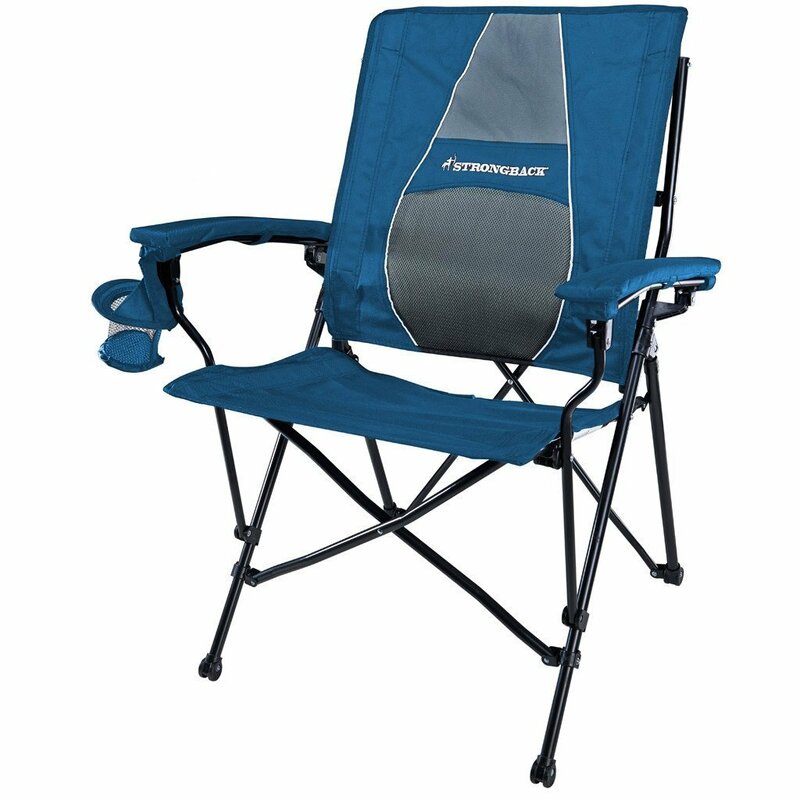 This is a wonderful lightweight yet strong and supportive camping chair for all campers, including campers with bad backs. There are three categories of a camping chair; these include the Minimal, the Regular and the Luxury. The minimal camping chair is essentially a frame with fabric that opens up from a folding position and comes with either simple framework with or without back support. These are not to be used by bad back sufferers but can be taken in time so stress from walking, and opened up as a quick respite. Essentially a minimal camping chair is more suitable for hiking. A regular camping chair is designed with a few more features and comes with armrests, backs, a more solid frame, and thicker materials. Regular chairs are also designed for lumbar preferences, so you can find some exceptional models that are good for a bad back. Luxury camping chairs are, as the name suggests, luxurious. They come with the top fabrics, covered and held in place by solid frames and include all kinds of features such as cup holders, pockets, leg rests and special lumbar cushions. These are the top of the range and provide you with exceptional back support. Load bearing weight: How many pounds can the chair support, consider that many chairs support up to 250 pounds, which is more than enough for the average person. However, large frame people and overweight individuals must consider stronger chairs, and when you add the weight of clothes, a chair that supports 250pouns is great, but one that supports up to 500 pounds is perfect. Consider that the more weight bearing capabilities, the more rugged and reliable the chair will be. The average regular and luxury chair will weigh more than 5 pounds, so it’s great for camping, but not for hiking. There are three core materials used for the frame; these are steel, aluminum, fiberglass, and carbon-fiber. 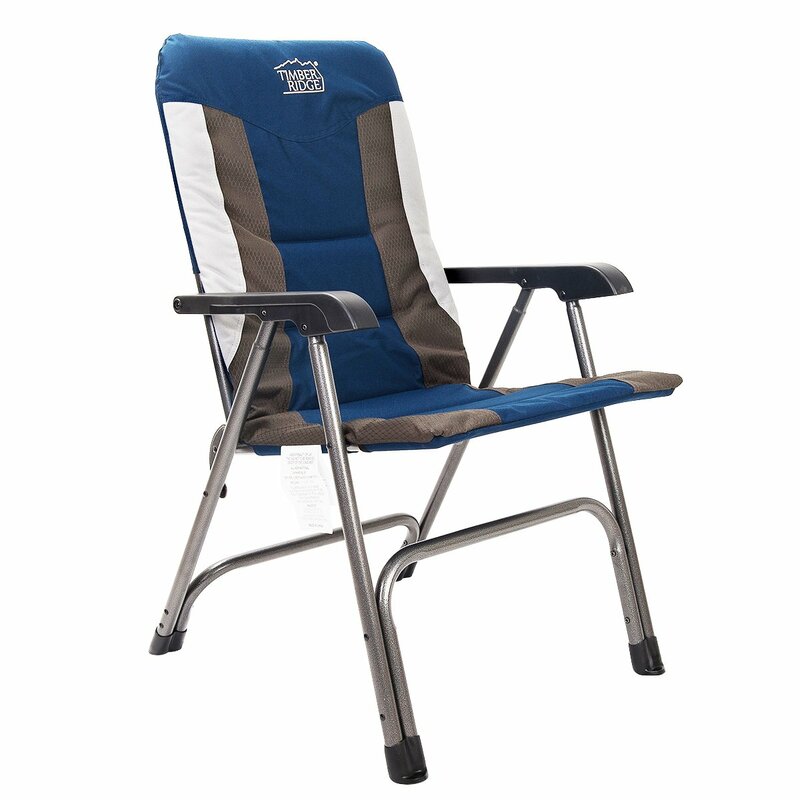 Steel is considered a good material for camping chairs due to their strength and reliability. Aluminum is lightweight and reliable for most loads, but fiberglass and composite are by far the best materials. Fiberglass is heavy, while carbon-fiber are light and strong and totally corrosion proof, on the other hand, composites are extremely expensive. The cloth material should be water resistant or waterproof, so a weaved nylon or coated rip-stop nylon is the best material for most applications. Add to this the closed cell foam padding, and you have a winning combination of waterproof material with comfort. The final consideration is assembled or unfolding. How easy the hinges and how many folds are needed to open the chair. The least moving parts are the most reliable. To sum up a buying guide for camping chairs suitable for bad backs, the budget is key to success, since bad backs require more features in delivering comfort, as such they will be more expensive. The features you want include a heavy load bearing weight, good materials that are rigid and do not offer a wobbly chair; this will lead to back injuries. You need an armrest, good lumbar cushions and if possible, folded padded lee extensions which will take the weight off your body. For sitting up, you want a specially designed seat that will fit your body frame.